University of East London, Docklands Campus. We warmly welcome you to attend our UEL “Different Pasts: Shared Futures” event for Refugee Week 2016. We have organised a mix of sessions to help showcase the initiatives currently being undertaken by staff and students here at the University of East London to help support migrants and refugees and to showcase new projects and research to help promote and celebrate the contribution of refugees to the UK, and encourages a better understanding between communities. 11am-12.30pm: Living Narratives in the Calais Jungle. With confirmed Speakers: Dr. Aura Lounasmaa (UEL), Dr. Cigdem Esin (UEL) ,Dr Tahir Zaman, (SOAS/UEL) and Marie Godin, (International Migration Institute, University of Oxford). 1pm – 2pm: Film Screening: Performing the Archive: Living Narratives and the Politics of Performance. A showcase of a recent civic engagement project with our second-year theatre studies students. 2pm-3pm: Archiving Living Histories of the Migration Experience: Oral History, Archives and the Hidden Narratives of Migration. Dr. Rumana Hashem and Paul Dudman, Archivist at UEL. 3pm – 4.30pm: Workshop: How can we engage with refugee communities and help document and preserve their life histories and enable their stories to be told? Showcasing our latest civic engagement projects including the Living Refugee Archive and the Mental Health and Wellbeing Online Portal and introducing the IASFM Working Group and Oral History Society Migration SIG and the Migration and Asylum Network. Led by Dr. Rumana Hashem and Paul Dudman. Roundtable discussion including past and present UEL Staff and Students on people-centred understandings of conflict and refugee movements and responses to global and refugee inactivates in light of current events. Chair: Professor Giorgia Dona. 6pm: Refreshments and Networking. Location: Ground Floor Library Foyer and Refugee Council Archive. Organised in Conjunction with the Refugee Council Archive at UEL; the Centre for Narrative Research, Centres for Migration, Refugees and Belonging and Centres for Social Justice and Change at UEL. UEL is at the forefront of research and teaching within the fields of refugee, forced migration and conflict studies. Specialist postgraduate masters courses exist in Refugee Studies and Conflict Displacement and Human Security. If you would like to explore the issues discussed during today in further depth, we welcome enquiries in relation to the courses that we have on offer. The key aspects of your learning will be the focus on conflict and displacement. We value a people-centred approach and an emphasis on human security which combines both human rights and human development. The course approaches development as an important security strategy and considers displacement a measure of human security. We will encourage you to adopt an independent critical approach to contemporary theories of conflict, human rights and human security. Both of these courses are situated within the field of Global Studies at UEL and work in close contact with our research centres including the Centre for Migration Refugees and Belonging; the Centre for Narrative Research; and the Centre for Social Change and Justice. 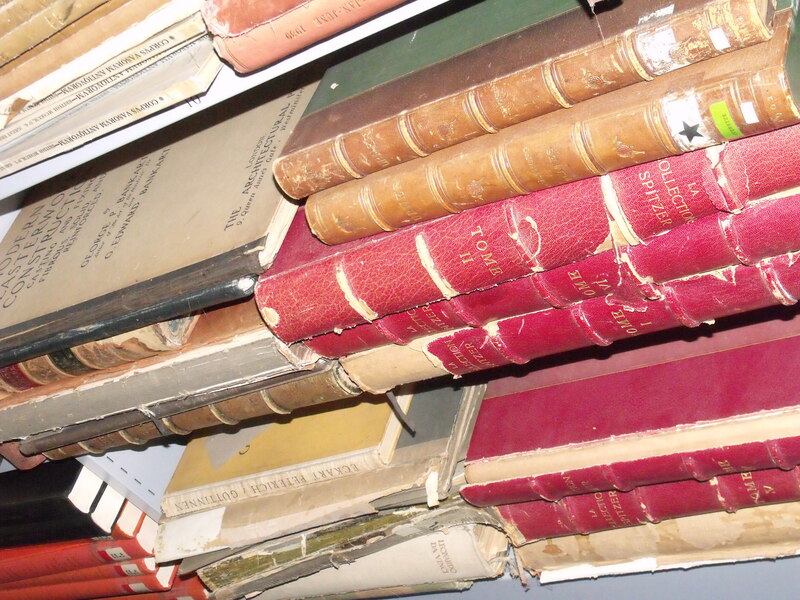 UEL is also the home of the Refugee Council Archive, hosted within the Docklands Library as part of a wider Archives provision, the Archive represents one of the largest collections of material documenting the history and development of refugee and forced migration issues with the UK. 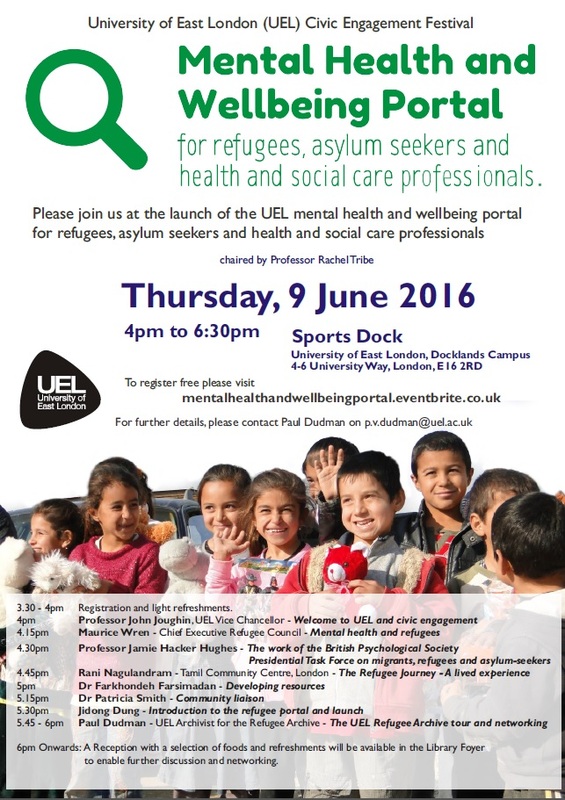 On behalf of the Organising Team, and in conjunction with the UEL Civic Engagement Festival 2016, we warmly invite you to attend the launch of our new Mental Health and Wellbeing Portal for Refugees, Asylum Seekers and Health and Social Care Professionals on Thursday 9th June, 2016. This has been a collaborative project between academic colleagues in the UEL School of Psychology and the Refugee Council Archive at UEL combined with the invaluable help and support of external practitioners. We have undertaken an interdisciplinary approach to the creation of an online resource which can be utilised as a first-stop resource for refugees and asylum seekers as well as mental health practitioners working in the field with refugees, migrants and asylum seekers and with the recent influx of refugees from war torn countries of Iraq, Syria and Libya, we hope the project website will be an invaluable source nationally to mental health professionals, community organisations, refugees and asylum seekers themselves and internationally to people in refugee camps or internally displaced people. 3.30 – 4pm Registration and light refreshments. 6pm Onwards: A Reception with a selection of foods and refreshments will be available in the Library Foyer to enable further discussion and networking. The CMRB AGM 2015 Agenda is available for download. On Lesvos, both the survival of the ‘locals’ and ‘refugees’ depends on decisions made in European Institutions. Refugees are currently arriving on the island at a time when an unprecedented process of underdevelopment is occurs in at the hands of these institutions. In this presentation, the speaker, who has been involved since 2009 with refugees arriving to her hometown, reflects on the way refugee arrivals are managed by the different statutory and non statutory European bodies. This presentation envisages creating an understanding and a discussion on what the social and political changes between Greece and Europe have been in the past five months and how these continue to affect the management and monitoring of refugees. It aims to encourage a discussion of the trends formed, by both European institutions and society, regarding their humanitarian and social welfare responses. Details included on attached flyer. Please circulate widely. We are delighted to inform you of an exciting opportunity for undergraduate students and those who have recently graduated. We have extended the deadline for abstracts. Is Sustainable Development Possible ? Economic, Social and Environmental Frictions. Students at University of East London (UEL), in partnership with the European Association of Development Research and Training Institutes (EADI) are pleased to invite you to the fifth student-led undergraduate conference for development at UEL. The conference gives students a unique opportunity to debate their work in a public forum, receive feedback from academic scholars, meet students from a range of international universities and network with potential employers. Past student presenters have described the event as “a high-value learning experience” and “a great place to take the first step of presenting at conferences”. We are confident in the fantastic opportunity this conference offers and encourage you to cascade the call for papers and information of the conference to students and recent graduates. You are most welcome to attend yourself and we urge you to inspire students to attend and participate in the conference as we feel that it will be an invaluable experience for all. Democratic Access or Privileged Exclusion? The University of East London’s Library at Docklands has been the home of the Refugee Council Archive for over a decade. According to the Archives Hub database, there are several other archives documenting refugee lives which co-exist in London and beyond. Questions arise as to who accesses these archives? Are refugee archives well-represented in relation to the preservation of lived experience of refugees and migrants? If not, why is this? Who get excluded from refugee-archives, and in what ways? How could we improve access to refugee research archives? This half-day workshop led symposium seeks to find answers to the above questions. It is a launch event of an outreach project, “Democratic Access or Privileged Exclusion: Civic Engagement through the Preservation of and Access to Refugee Archives”. In February 2015, under the auspices of the UEL Library and Learning Service, a bid was submitted by the Refugee Research Archives at UEL and the Centre for Migration, Refugees and Belonging, focusing on the preservation of refugees and migrants lives through engaging with local refugee communities. Awarded with an internal fund from the University of East London, we sought to use existing Archives held within the UEL Library as a basis to forge new partnerships between communities, students, academics, archivists and practitioners within the field of refugee and migration studies. At this end of project workshop we wish to share our findings with you which can help to generate a discussion on how to make archives as accessible, inclusive, representative and democratic. We will showcase the oral history of local communities and refugees made accessible through the new website of Living Refugee Archive. All welcome. The event is free but registration is required for catering and space purposes. Please register before end of June. Join us to discuss what can be done to improve access to refugee archives. 13:30 Registration Opens. Tea and Coffee. Discussants: Dr Ben Gidley (COMPAS, Oxford), Sarah Menzies (Evelyn Oldfield Unit), Maurice Wren (Refugee Council), Dr Toby Butler (Birkbeck and UEL), Paul V Dudman (Refugee Archives, UEL), Dr Rumana Hashem (CMRB, UEL), Dr Tom Vickers (Northumbria University). Hosted by the Refugee Archives and Library and Learning Services of University of East London. Please let us know if you need a parking space on campus as we will need to take further details from you in order to arrange for a campus parking permit. For further details and information, please contact the Archivist Paul Dudman on p.v.dudman@uel.ac.uk or +44 (0) 20 8223 7676. A Civic Engagement Project at the Refugee Council Archive, University of East London. On behalf of Refugee Council Archive at the University of East London, we would like to introduce to you a new Civic Engagement project that we will be working on between now and the end of July, 2015. As part of this project, we are seeking to further develop and enhance existing and new partnerships with local community groups, NGO’s and archival institutions with an interest in the preservation of the important documentary heritage associated with recording the history of the refugee lived experience. 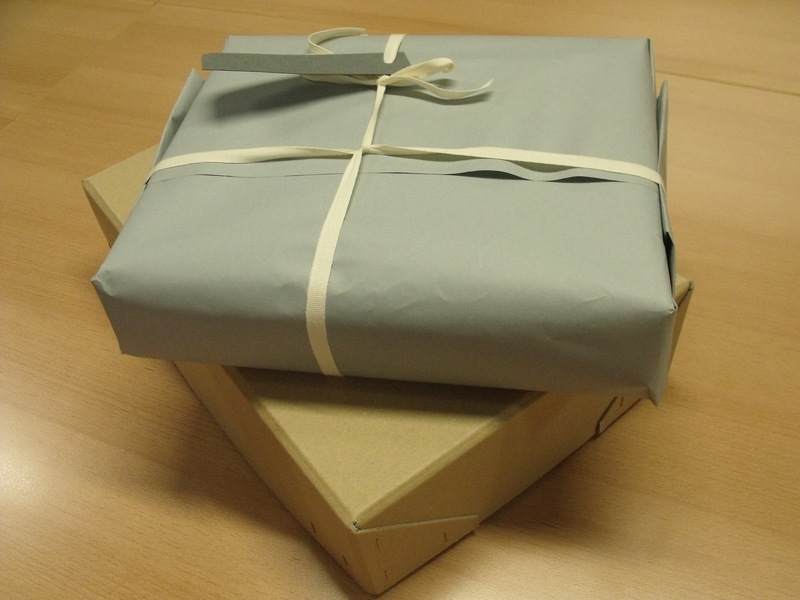 Our project entitled, “Democratic Access or Privileged Exclusion: Civic Engagement through the Preservation and Access to Refugee Archives”, aims to use existing Archives held within the UEL Library as a basis to forge new partnerships with students, academics, archivists and local community groups. The project was awarded internal funding from UEL’s Civic Engagement Fund and is being coordinated by Paul Dudman, the Archivist responsible for the Refugee Council Archives at UEL, and Dr. Rumana Hashem, a post-doctoral researcher at the Centre for Migration, Refugees and Belonging (CMRB) at UEL. We are looking at ways in which we can engage our existing Refugee Archive collections with our communities beyond just academia and to make the collections both relevant and accessible to both local community groups and the wider NGO and third sector bodies. We hope to achieve this through the collection of oral histories and the creation of both a Living Refugee Archive website and a Refugee Archives and History Group. This was inspired by seeing the work undertaken by the Vietnamese Oral History Project at the University of California, Irvine (http://sites.uci.edu/vaohp/), which assembles, preserves, digitizes and disseminates the life stories of Vietnamese Americans in Southern California. a) The creation of Refugee Archives and History Group to help facilitate continued discussions and civic engagement activities, and to help encourage interaction between archivist, historians, NGO’s and the communities themselves as to how the refugee experience can be preserved and documented. b) To engage with local communities in an attempt to establish a Living Refugee Archive and to promote and enable accessibility and engagement with our existing collections. This will be documented through the collection of oral histories. 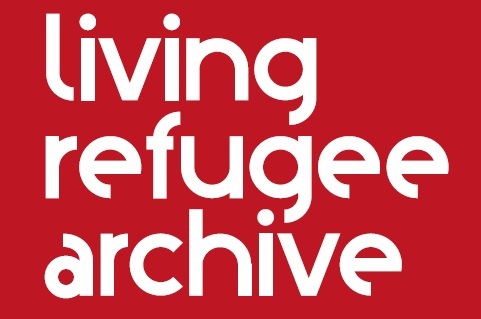 c) To pilot a Refugee Living Archive website to incorporate digital content collected as part of our Oral History Project and, if successful, this could lead to a continuation of this project beyond the initial timescale outlined in the bid. d) To facilitate UEL Student engagement in the project through, for example : (1) The contribution of oral histories and archival materials; (2) To help engage with local communities with Archive-led activities and to help the local community/refugee groups understand how the Archives which UEL holds can be relevant to their own community. Please do let us know if you would be interested in meeting to discuss this project or should you have any thoughts or feedback which t we could use to enhance the project. Your support and participation would be very much appreciated. and History Group mailing list. Full details can be found on the attached flyer. Please circulate widely. Abstract: The language, logic and practices of austerity seem to have saturated everyday life. In the process, we have lived through a concerted attack on ideas of entitlement and equality. This paper tries to understand the manner and nature of the shift in popular discourse and institutional practices brought about through austerity measures. The paper argues that (i) austerity is not and has never been designed as a short-term measure (ii) austerity represents an attempt to reshape the political terrain in a manner that dismantles many of the partial gains of the twentieth century (iii) this dismantling goes far beyond a cutting of service provision and threatens to corrode social connections and confound the articulation of entitlement, solidarity or conviviality. As always, the question is how we think beyond the constraints of this unhappy moment. Bio: Professor Gargi Bhattacharyya is Professor of Sociology at the University of East London. She has written extensively in the area of ‘race’ and racisms, sexuality, global cultures and the ‘war on terror’. She is completing a book with Palgrave Macmillan on equality and justice in a post-austerity world.